They also distributed many thousands of leaflets such as the one on the left – full of untruths and smears, such leaflets enable Labour to get around election spending limits by pushing their message whilst not having to be registered as an election expense due to their ‘third party’ origin. Photographs taken during the campaign showed Labour activists putting these out with their own literature, conclusive proof that they were working hand in glove in a desperate attempt to retain their Parliamentary seat. Paul Nuttall had also moved in to the area just prior to submitting his election papers – once the address was out in the open, he had to move after people tried to break in to the house and he was subjected to a campaign of hate mail and intimidation. Negative campaigning – Why put across your positive vision for a community when you can merely attack your opposition with half truths and downright lies? Religious intimidation – When it became apparent that UKIP were making inroads in to their traditional ethnic minority vote, a Labour activist emailed local Muslims telling them they would ‘go to hell’ if they didn’t vote for the Labour candidate. A clear breach of electoral law and downright nasty and sectarian from a party that claims that UKIP are divisive. 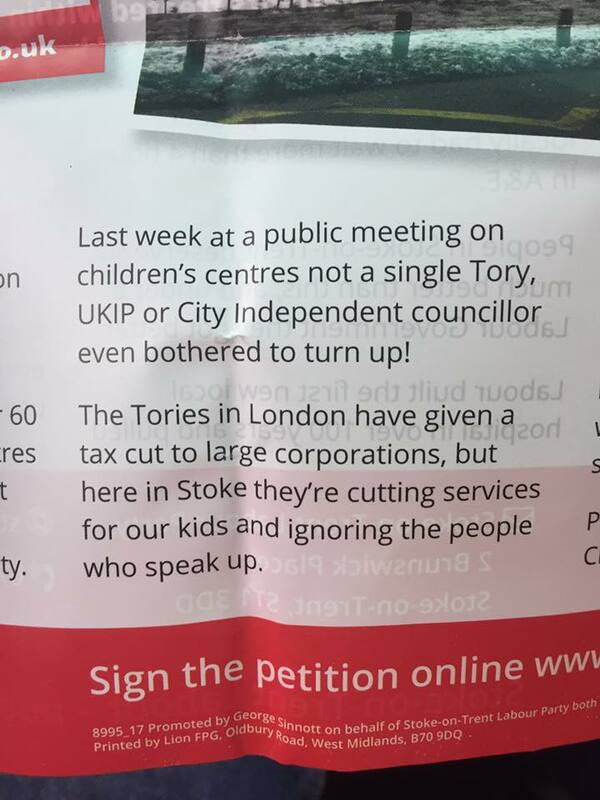 Fake ‘public meetings’ – Labour put out a leaflet claiming that UKIP and Tory councillors had failed to turn up for a public meeting on local children’s centres, supposedly proving that only they cared. Except it wasn’t a public meeting but one organised by Labour for their own people with no councillors from other parties invited. Patriotism – Labour made sure that the Cross of St George was on top of their election literature, supposedly to try and convince people that they care about England. Yet their stated policy aim is to divide our country up in to regions whilst they frequently attack anybody (Myself included) who displays the flag as a small minded ‘Little Englander’. There is also evidence that they despise anybody with a patriotic viewpoint, most notably when Emily Thornberry MP mocked ‘white van man’ at a previous election on Twitter for having the flag up on his house. So, there you have it. The new ‘Kinder, gentler politics’ that was trumpeted by Jeremy Corbyn not only failed to materialise but the exact opposite was in evidence. 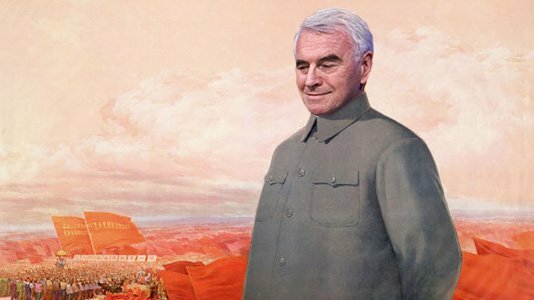 The ‘energy, passion and tactics’ that Labour employed would not look out of place in a totalitarian dictatorship or a corrupt developing country, yet Momentum are asking for this to be replicated up and down the land. But then, it is hardly a surprise when you see the type of people who are idolised and quoted by those at the top of their party. This kind of regressive intimidation must not be allowed to win in an open and free democracy. 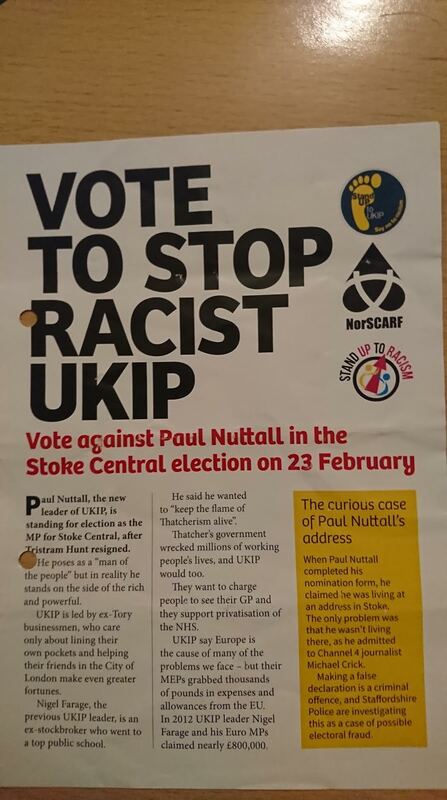 This entry was posted in Elections, Local Campaigns, UKIP and tagged Gareth Snell, Hope Not hate, Labour, Momentum, Paul Nuttall, Stoke Central, UKIP.